"We went to York on one of the worst of the recent snowy, icy weekends... we contemplated going on the train, but there was no service between Hull and Doncaster. So we went to catch our beloved and reliable X46, feeling that perhaps we were indertaking a perilous journey, but that we needed to see relations before Christmas as a priority. [The driver] was splendid; what a good steady and safe driver. We didn't have any further qualms; we just settled to enjoy the journey. We would therefore like to bring her excellent service to us to your attention." "Such was the thoughtfulness and consideration shown by the [Service 154] driver in extremely difficult circumstances I feel it is only right and proper to let you know that this particular driver is worthy of some recognition." "Just to say the lady bus driver this morning was absolutely brilliant getting us to work at Castle Hill Hospital this morning. Even though the bus got stuck on a couple of occasions she managed to free it and keep going. She did marvellously. Many thanks to her getting us to work on time." "...a big well done to the drivers who are turning out and running the services - 151 passed here last night...with so many other services and businesses closing down, it is admirable that the buses keep trying to run." "I would like to take this opportunity to say a huge thank you to the drivers manning the 154 bus route. They have been marvellous in tackling the adverse weather conditions with no help from other council services such as snow ploughs or gritters! All have been very patient and helpful to all members of the public and are a credit to you and are very much appreciated by the public who use this service." "Just like to pass on my thanks to your drivers and staff for keeping the buses going in such atrocious weather. I left my car snow bound at home and took my luck with the buses - the drivers were cheerful and very optimistic. Some people will complain that they were running late - they were lucky to have buses at all! There's no pleasing some people. My thanks again." "Just to say well done for doing your best with the buses. It can't be easy. Thought you might like some praise instead of the moans I am sure you have had!" "How do I say thank you to EYMS drivers for managing so well in this weather, we have been served very well in our area and I think they all deserve a big round of applause or at least a 'thank you' ". "I think I can say that the snow has made travel a bit more problematic!!! But your buses somehow always manage to keep running! When I've used the buses I've always found them reliable and the staff helpful, but this last week or so I honestly do believe that the staff at EYMS have excelled themselves, even by their high standards... Many thanks." "I have complained in the past re buses not stopping where they should so it is only right to give praise where due. My wife has travelled between Pocklington and York and returned on your services when the wimps of York bus services have given up." "As my car lies marooned in acres of crisp white snow, once again I have made it to my desk courtesy of the sterling efforts of your estimable bus drivers. It is most pleasant reading the morning news whilst others take the strain. From one appreciative customer!" "Many thanks to the bus drivers of EYMS. They got me safely in and out of Hull today while skidding round far less able, car-bound people." "How fantastic the driver of the 5.22pm from York was on 29 November, the conditions of the road were awful but I never felt nervous once. [The driver] deserves praise for the way he got us home." "I have been able to get into and back from work from Willerby on the buses (44 and 154) every day this week and have only been late once despite the terrible weather! The service and the drivers have been brilliant. Please would you be sure to pass on my thanks to everyone involved for their efforts - they are much appreciated." "I think the driver deserves a medal for getting our service to York. I'm really grateful for the reliability of the service in wintry weather." "I would just like to say a big thank you to all the guys from EYMS who helped the cars get over the Anlaby Road flyover [outside our Head Office] tonight, we could have been stuck there all night without their help. Thanks." "Well done on embracing modern technology and keeping everyone up to date [on Twitter at www.Twitter.com/EYBuses]. You wouldn't catch [other bus companies] doing that! Brilliant stuff!" "Please can you thank the amazing driver of the 154 which left town at 4.45pm today. Got caught up in the horrendous conditions on Gorton Road all the way through to Cottingham and he was brilliant. He averted so many potential crashes." "Excellent service last night getting one of our team almost home to the villages. Lady driver was amazing, keep up the good work." "On behalf of the passengers on the buses in Bridlington, especially on the 512/3 route, I would like to say a big thank you to the drivers, especially the ones on the early 512/513 buses, for maintaining the service in the atrocious weather conditions we have had yesterday and today. 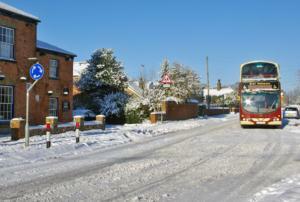 Yesterday morning the bus had to stop on Trentham Drive and subsequently got stuck. The driver was laughing and joking with the passengers until another bus came up and managed to stop higher up on the flat. We all got on the other bus and that driver also was very friendly and said he hoped we would get to town, which we did." "Just a short note to say how well the female driver on the Service 35 bus at 4pm from the Interchange drove last night. I felt at ease with her driving and got home safely." "I would like to say a sincere 'thank you' to all at EYMS who have kept the bus service going around the city during the past few week's severe weather. The buses I use along Willerby Road, when I was able to access a bus stop being disabled, were as near to the timetable as possible and the drivers waited until I was seated before moving away from the stop. Despite the terrible driving conditions they were all cheerful and I would be obliged if you could pass on my comments." (Thank you, we have let the drivers know of your thanks - EYMS). "I have always found East Yorkshire bus drivers very polite and exceedingly pleasant. During this excessively bad weather your drivers have really excelled themselves, nothing has been too much trouble for them and they have all had a smile for everyone, plus ensuring wherever possible no-one has been left standing at a bus stop. A great big thank you to all EYMS drivers, well done. From 154/152 passenger." "Thanks to the the drivers on the 121 service through Hunmanby for their humour and safe driving." A phone call came in from an East Yorkshire Coaches customer who had travelled on the trip to Grassington on 4 December. She said the driver was very helpful ensuring that people got on and off the coach safely. She said the driving in very bad conditions was excellent, making her feel at ease, and the driver is a credit to the company. "Once again we have had two successful trips [with East Yorkshire Coaches], our driver certainly played a big part in making them run so smoothly, he was excellent. Due to the weather conditions the one night trip would have been a disaster but for his professionalism. Thank you for all your assistance in helping us organise these trips, and we hope to be able to arrange one for next year." "Congratulations to [X46 driver] for the excellent driving standards you have maintained on Service X46 during the recent extreme weather conditions. You should be nominated for 'driver of the year'." "My partner and I had to visit Hull during those bad two weeks at the end of November/start of December, and I would like to compliment EYMS on the professionalism of the drivers who did a very good job on the journeys we made. We appreciated the service overall and the simplicity of ticketing when we were able to use a weekly ticket." "Just to say I appreciated how well the Bridlington 503 bus service has operated during the bad weather, even on untreated roads." "Please pass on my thanks to all the drivers on the Hull-Withernsea route. I live in Patrington and my car is snowbound. I got the bus to work today and just wanted to say thanks for maintaining the service in very difficult conditions, I really appreciate it. Well done, and thank you." (We hope you'll give commuting on the bus a try in better weather - EYMS). "I would like to thank the bus company for managing to keep the buses running for as long as they did during the horrendous weather conditions, I am grateful for the efforts of the drivers." "I would like to applaud all your drivers for getting through to people and for keeping this city alive and moving. You all deserve a medal for braving the weather, I take my hat off to you all. You are a credit to EYMS, your families and to the city of Hull." "Could I just say a big THANK YOU to all your marvellous bus drivers who have got us to and from work safely. They have done sterling work, remaining cheerful in the face of adversity." "A big thank you to all the drivers for keeping the buses on the road." "Thank you for all the support you are giving the public, it is greatly appreciated." "I would like to say a big well done and thank you to your staff and drivers for keeping the buses going in this adverse weather and terrible driving conditions. I use the 154 service and despite very difficult conditions it has been service with a smile all the way through. Thank you. I applaud the drivers and your company for the way the drivers present themselves, their courteous behaviour even when passengers are not behaving the same way. I like the fact that when you say remain seated until the bus stops you mean it. The drivers will wait until the bus stops, allow everyone to get off and then wait a moment more before moving off from the bus stop. So whatever you are doing, well done and keep up the good work." "I would like to congratulate your drivers for the sterling way they have coped duing this spell of bad weather. I don't drive, but I would not have wanted the responsibility of driving a bus complete with passengers in the conditions they have driven in." "A big thank you to all the EYMS drivers for their fantastic efforts during this awful weather. You have all been absolutely fantastic." "I would like to congratulate and thank all the drivers who have worked throughout these last weeks. During the dreadful conditions we have experienced all the drivers have shown exemplary patience, good humour and care to everyone. Many thanks to you all, without you many of us would have found it impossible to conduct our lives with a semblance of normality." "Like many others, I would like to thank the drivers of the 154 route for doing such a good job during the recent bad weather. They worked beyond the call of duty!" "Congratulations to all concerned for the service you're running in very difficult circumstances. Best wishes to all the staff." "I want to commend [the driver of Service 142] for doing a brilliant job, the driver couldn't get into the village due to the road conditions so he walked to the bus stop to let them know. This was greatly appreciated." "Thank you to the driver of Service 142 who brought my daughter home safely from visiting family in Cherry Burton. The journey was during the severe snow storms we experienced within the region." A Parish Council wrote to "express thanks on behalf of the villagers for the service provided by EYMS with the 121 service during the recent severe weather... please pass on to your drivers and their maintenance staff our thanks for their hard work throughout December. It was and continues to be great appreciated." "...how brilliant the  drivers were during the bad weather, they never failed to turn up, always on time and always got the customer there safely...cannot praise the drivers and EYMS enough. Absolutely brilliant." Thanks to all who took the time to write or email in, we've passed on your comments to our drivers and staff to show them that their efforts really are appreciated. EYMS.